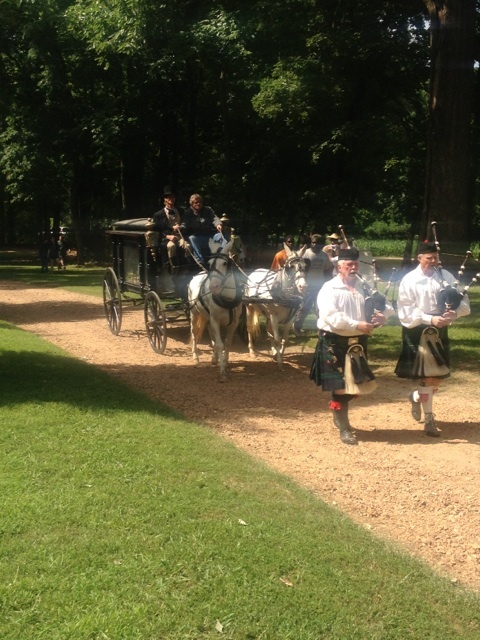 Last weekend, the 150th Anniversary of the Battle of Hernando reenactment took place in Hernando, Mississippi. The reenactment takes place once every ten years at the Mussacuna Plantation just outside of town. At last weekend’s reenactment, approximately 3000 people attended during the two-day event. It was a great turnout, and gave people the chance to see what it was like in 1863. Members of the Varina Howell Davis Chapter #2559 United Daughters of the Confederacy, as well as the Samuel A. Hughey Camp Sons of Confederate Veterans, the Bonnie Blue Brigade, the 17th Mississippi Reenactors Group, the DeSoto County Museum, and the Masonic Order helped sponsor the event. I’ve seen several examples where a writer or producer changes history by retelling the story. Several recent examples include “Abraham Lincoln: Vampire Hunter” and “Little Women and Werewolves.” Granted, these are both Sci Fi examples, but there have been a lot of others over the course of the years. What if Hitler won WWII? What if aliens attacked cowboys? What if? Here’s another example of a “what if” situation. Devin Nuhfer has directed and co-produced ‘The Confederation,’ a future web series set during the 1960’s in a world where the South won the American Civil War. The series will follow a squad of Confederate female snipers and a group of former slaves. Gettysburg Campaign by J.D.R Hawkins.